As we mentioned in this post on keeping costs down, we have been cooking at our apartment a fair amount. 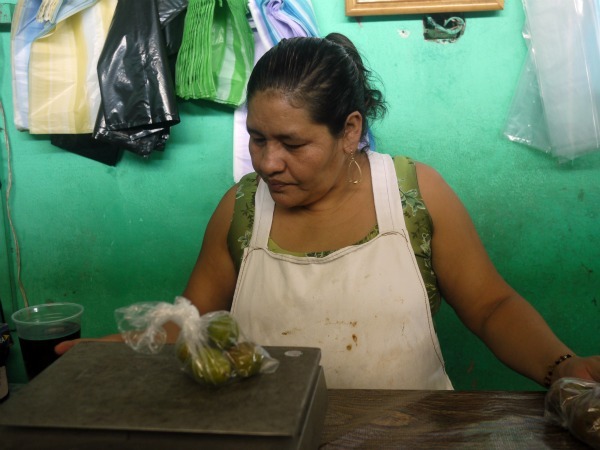 We head over to the Mercado Benito Juarez, in the center of town, every few days to pick up things like white rice, black beans, tomatoes, avocados, limes, papaya, pineapple, guavas, bananas, onions, eggplant, broccoli, jalapenos… you get the idea. We then usually stop by at the largest supermarket in town, Super Che, to get things like granola, yogurt, and any specialty items like chips, chocolate, nutella or salami, that we’re craving and just have to eat. Makes a lot of salsa, about 0.5 to 1 liter, depending on whether you add tomatoes or not (see end of recipe). Blend it all up in a blender or food processor until it’s no longer chunky. Variations include adding tomatoes for a red salsa (2 to 5 tomatoes, depending how diluted you want the salsa), or tomatillos to make a milder green salsa. for garnish and seasoning, served on side: cilantro, limes, sour cream and Tasty Hot Salsa (recipe above). Heat oil on medium and sautee onion until translucent and slightly browned around edges, about 4 minutes. 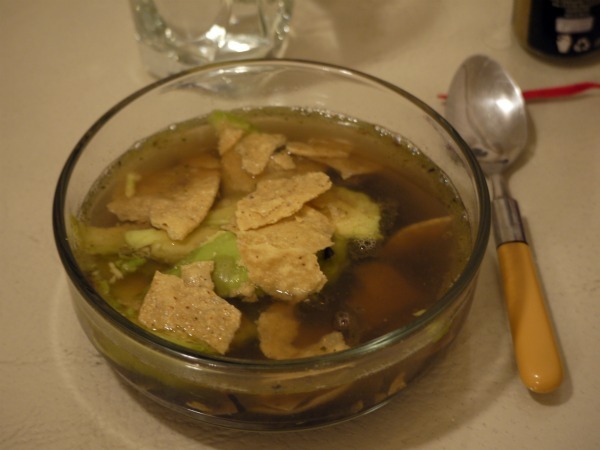 Remove from heat and add black beans to each bowl before serving stock into them. Add sliced avocado and tortilla chips. Garnish with cilantro and juice of 1/4 lime per bowl. Serve sour cream, salsa, more lime and tortilla chips on the side. Makes 8 tacos so full that they will fall apart while you’re eating them, so keep extra tortillas on hand to use as backups. 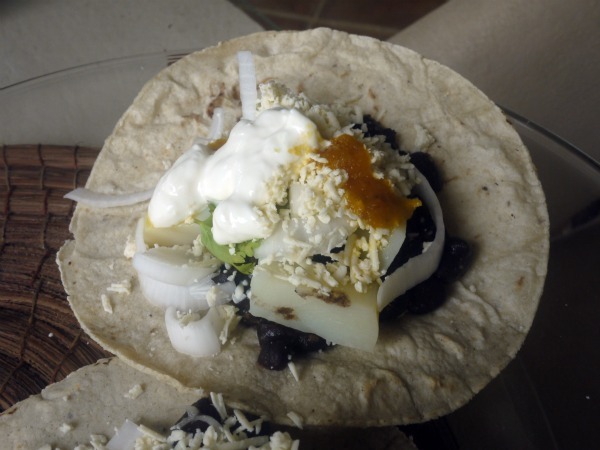 Assemble tacos with whatever combination of above ingredients tickles your fancy. 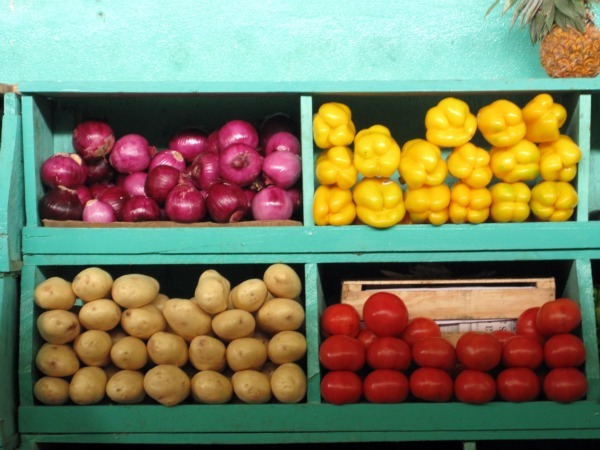 Variations that we’ve made here include sauteed eggplant, and just the raw ingredients when we’re lazy. Mash up avocados and stir in the other ingredients. I’m not going to pretend we made these pancakes from scratch. They have Aunt Jemima here, too. We just added water (no need for eggs, even!). We did squeeze that orange juice ourselves, though. 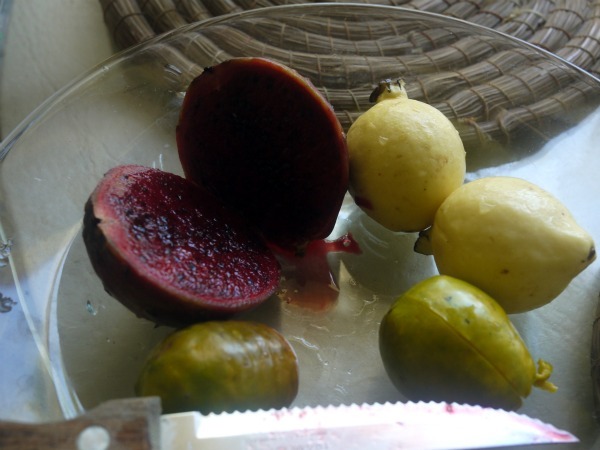 Guavas, quartered (but we don’t eat the skins). 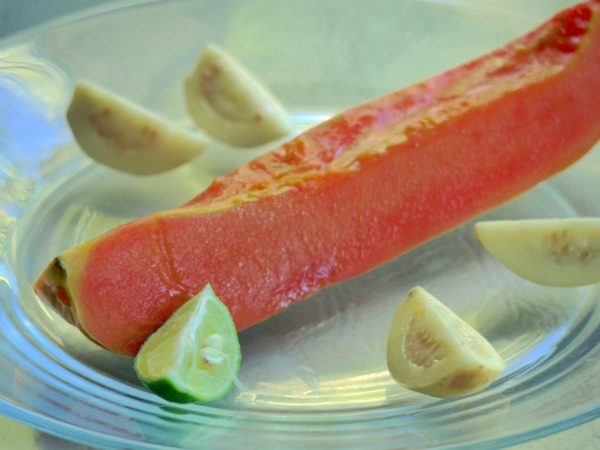 Those are guava quarters in the above papaya photo. Tunas rojas — not sure what they’re called in English, but they are red fruits from cactus plants. The green versions (tunas verdes) are not as sweet. Most mornings, we eat granola with plain yogurt, bananas and local honey for breakfast, with strong home-brewed coffee. Yum! We miss you guys…But looks like you are having such a great time. Glad you’re both back surfing! Miss you guys! Love to all of you from both of us. We LOVE the food here! Miss you guys, drop me an email when you have time! I want to make all the recipes. Send more. So great witnessing your trip!